After shouting the merits of Autumn sowing broad beans in this post, this year I didn’t get round to it. The reasons, too wet, too cold, too comfy on the sofa, you name it, whatever, it just didn’t happen. Knowing that there will be much regret come late May, early June if there is no crop I decided a couple of days ago to mend my ways. 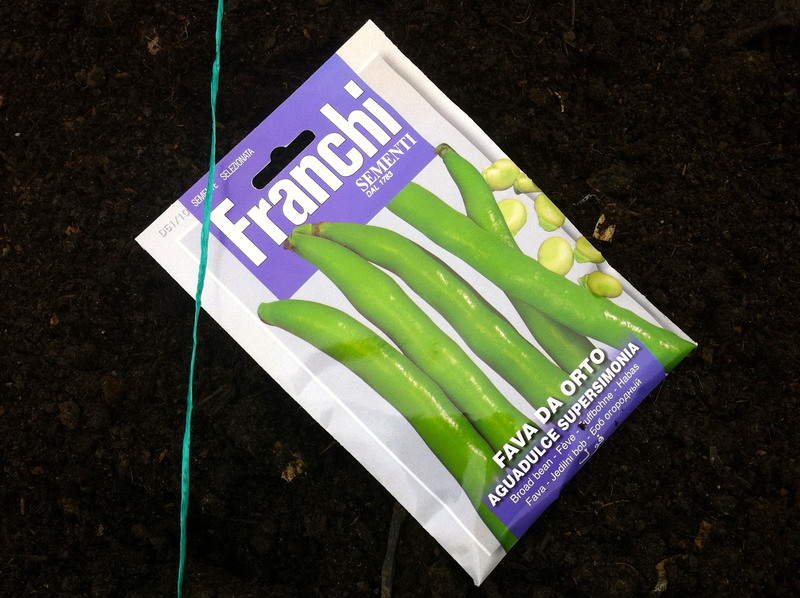 The seeds this year have come from Franchi Seeds, the variety, Aquadulce Claudia, is the same. An hour later the job was done. Three rows in a raised bed and a cage built over the top. I am now researching natural methods of deterring black fly, so if you have any thoughts or ideas please let me know in the comments. I pinch out the tips before the blackfly colonise the plants and make a soup from them (the bean tips, not the blackfly). I always do what the above do – but one year I noticed a column of ants marching up and down the broad bean stems eating all the black fly – now if that’s not a natural deterrent I don’t know what is. My tip is to plant as early as possible – even the Autumn before and you should find you have harvested your last bean by the time the aphids arrive! It works for me!